Click the link at the bottom of the article to download a PDF version of this update. 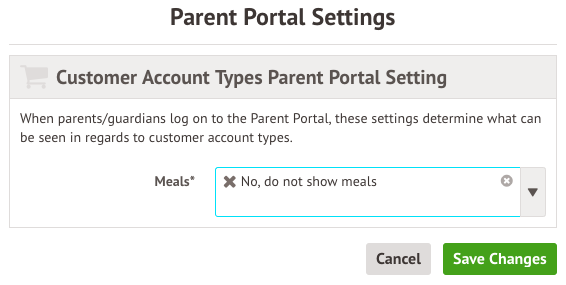 Choose whether to display each Customer Account Type set up on the Parent Portal. To choose your settings go to Students > Parents and guardians > Parent Portal Settings, scroll down to the Payments section and click the Customer Account Type. You can also complete this action from School > Payments > Setup > Customer Account Types. Toggle whether positive or negative Incidents are displayed to parents - great if you want to share your positive incidents automatically but not your negative ones! Note: both types of incidents will automatically be set as Off. For more information on customising the Parent Portal, click here. See Grade Distributions for Ad Hoc and Standardised Assessments. We’ve also added some group by options to the chart so you can view, for example, boys vs girls. We’ve improved how assessments are added to your Assessment Policy. Now just select your Assessment Type and Assessments from the drop-down menus! View staff Contracted Hours alongside other allocations on the School > Timetable > Staff > Teacher Hours page. This is calculated from a staff member’s Contract Post Salaries. See guardians who are not linked to any students in School > Data > Data Quality Dashboard > Guardians > Guardians with no linked students. To delete the guardians, just tick the boxes next to their names, then click the blue pencil icon. You can also click their name to go to their profile and link them to a student instead. Escalate a Behaviour Incident that happens in a lesson to the Second in Department, Head of Faculty or Second in Faculty. More updates to Exams are on the way! This includes a new method for entering candidates by group or course, being able to copy seating plans and more easily manage Access Arrangements. We’re adding more ways to customise assessments including showing when a mark was not required for the student or that they were absent at the time of assessment, and the ability to create Data Collection Policies, allowing you to set when certain assessment marks should be collected and by who. We’ll be introducing the ability to record, save and submit observations, e.g. lesson observations, using a template created by you. This includes creating your own gradeset, themes and strands to be observed. We're updating our Download Student List functionality. You’ll be able to easily choose which data to download and in which order - similar to the way you choose columns in the Custom Report Writer. Our integration will allow you to send student demographic data to MARK. You’ll then be able to analyse your test results for PUMA and PiRA on our new School and MAT MIS dashboards. We’ll be making our Group MIS permissions more granular, allowing your staff to complete as many actions as possible while maintaining the correct levels of safety and data protection. Take a look at our article for what this means for your MAT. If you want to propose your own improvement idea, contact our Customer Support Team. An article like this is published every other Friday in the Updates section of our Help Centre.